English Harbour and Jolly Harbour make ideal yacht headquarters. For English Harbour's fine facilities, see the following site: Nelson's Dockyard. Now in its 5th year, this four day event comprises three days of exciting racing mixed with lots of social activities. Other events of the year organized by the Antigua Yacht Club are the annual High Tide Series, Green Island Race, informal Round-the-Island-Race and the "after work" Thursday afternoon races for all-comers. Despite the current financial challenges, the 43rd edition of Antigua Sailing Week (24- 30 April 2010) promises to be one of the best yet. The organisers of this annual Caribbean classic have listened to the competitors’ views and have come up with a new, tweaked format, incorporating some of the event’s traditional features such as reintroducing lay day, and the Dickenson Bay Beach Bash. There will also be an extra day’s racing, with the series kicking off on the Saturday afternoon following an early morning breakfast briefing. For serious racers, the big boat Ocean Series is now a key element of Antigua Sailing Week and is really starting to attract some quality competition. 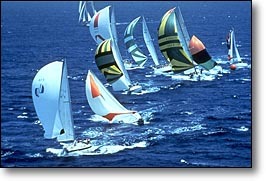 The aim of this three-race series (Guadeloupe to Antigua Race – 23 April, Yachting World Round the Island Race – 25 April, and the Round Redonda Race – 28 April/lay day) is to allow the crews on big racing yachts, many of whom will have been competing in some of the other Caribbean regattas such as the RORC Caribbean 600 race, the opportunity to enjoy a selection of long-distance ocean races at ASW. There will be record-breaking opportunities in all three races, individual race prizes, and overall series prizes which means competitors have the option to compete in all three or individual races. The results of the Yachting World Round the Island Race on the Sunday will count towards the overall Antigua Sailing Week points for those who want to compete in that too. Niklas Zennstrom’s JV72 Ran with a star-studded team of British professional sailors onboard including Tim Powell, Adrian Stead and Steve Hayles, will be another team to watch out for. Danilo Salsi from Italy has also confirmed his place on the startline with his stunning new Swan 90 – DSK Pioneer. This yacht made her debut in the Caribbean last year and looks set to make a big impact on the racecourse in 2010.